Almost 25 years ago, on Mothers Day, I received my first Mother’s Day present. She was an itsy bitsy five pound premmie with black-brown hair and big blue eyes. Quite a present. My daughter made me a mother. My favorite way to celebrate Mother’s Day is being with my kids. Presents aren’t important. Shared moments are the gift I crave. My kids have always liked to turn the tables on Mothers Day and cook for me. From the preschoolers “cooking” my breakfast for a tray in bed, to more elaborate meal presentations later on. When my son was in middle school, he and a best buddy began the Mothers Day Dinner tradition. The boys would get together in the morning and plan a menu including appetizer, main dish, and dessert. They would find recipes online, do the grocery shopping themselves, and then spend the rest of the day cooking with almost no outside help. The meals were adventurous and delicious. There were occasional glitches that we will call learning experiences (the chicken needs to be defrosted before putting it on the grill). Presentation was paramount. Squiggles of chocolate syrup adorned the plates of home made sorbet. The unifying ingredient in all of the menus was love. This tradition continued until the guys went off to college and aren’t home in May. I miss them. It’s a lot easier to spend Mother’s Day with your kids when they are little (or even medium sized) and live with you. When they are full sized, they go off to college or move to other cities. I am lucky that my daughter has returned to St. Louis for the time being, but it’s hard to get the whole family together. I have learned to celebrate any time we are able to be together. On Mother’s Day I kind of get a promissory note for hanging out some time in the future. But what if it’s not the kids who aren’t home for Mother’s Day, but the mom? That is the situation for deployed military moms. I recently learned that there are over 214,000 women in active U.S. military service and approximately 40 percent of them are moms. That means that there are a lot of moms who are deployed, serving their country abroad and not with their kids for Mother’s Day. That has to be so difficult for the moms and for their children. 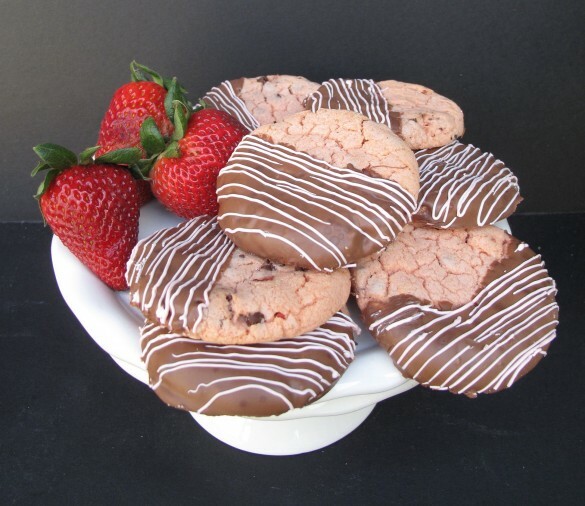 This recipe for Chocolate Covered Strawberry Cookies is dedicated to those military moms in appreciation for their courage and sacrifice. 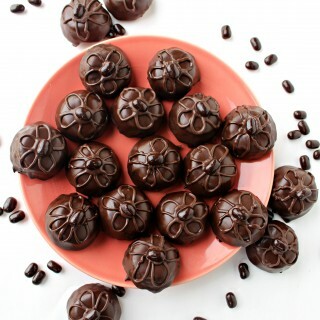 Chocolate covered strawberries make a wonderful Mother’s Day gift but don’t make a good care package item. 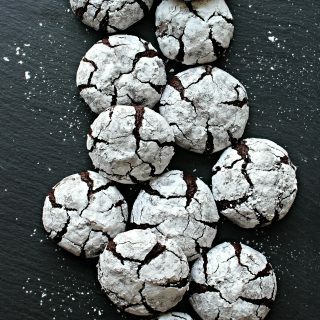 Instead, how about a desert-safe recipe for cookies that taste like chocolate covered strawberries? These cookies start out crunchy-chewy and become just crunchy over time, but are still delicious and full of strawberry-chocolate flavor. 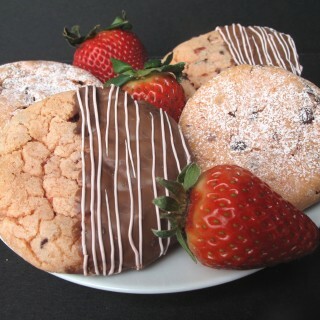 With these cookies in a Mothers Day care package, chocolate covered strawberries can even be sent to moms in the desert. 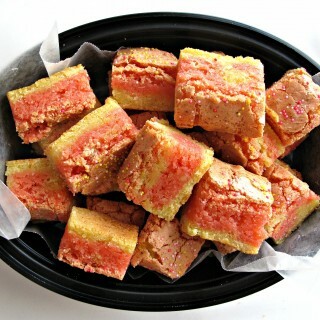 To make this recipe desert-safe I used vegetable shortening and white sugar. The strawberry flavor comes from two tablespoons of strawberry jello powder and chopped freeze dried strawberries. A dusting of strawberry flavored confectioner’s sugar adds the finishing touch. When desert-safe is not a concern, the original recipe used butter instead of shortening and a combination of light brown (3/4cup) and granulated (1/4 cup) sugar. Cookies made with butter and brown sugar will be chewy for longer than those made with vegetable shortening and only granulated sugar. 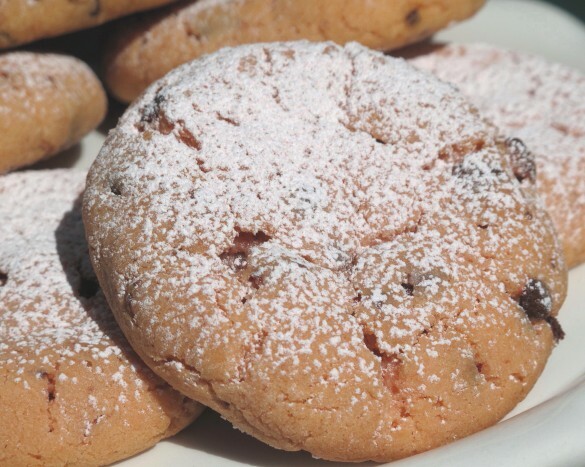 The strawberry-chocolate cookies can be dipped in melted chocolate or sprinkled with flavored confectioners sugar. 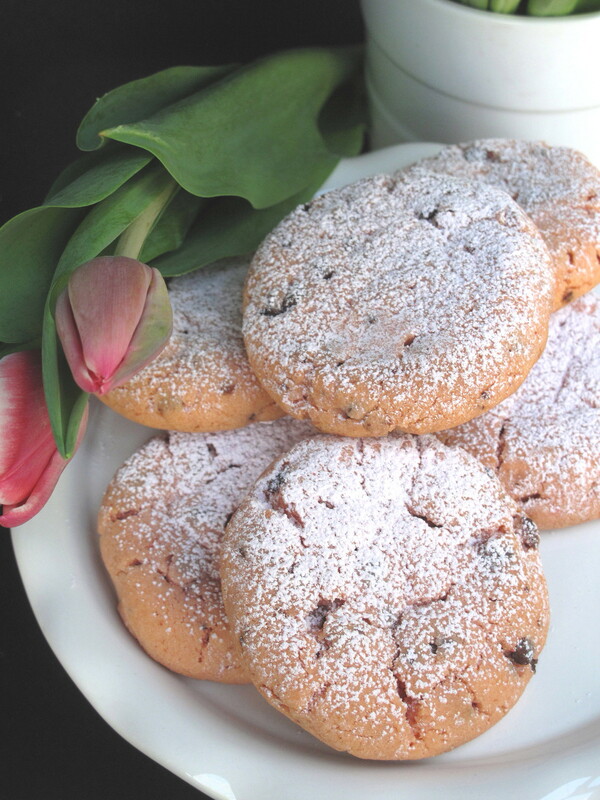 Note about flavored confectioner’s sugar: I made a great discovery while working on these cookies. I found an easy way to make FLAVORED confectioners sugar!! By grinding up freeze dried fruit (in this case strawberries) in the food processor with confectioners sugar, a colored, flavored powdered sugar is the result! 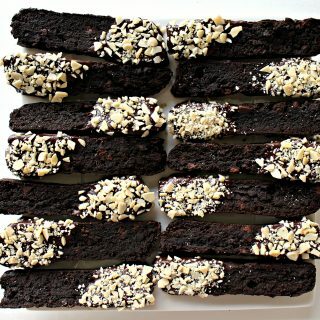 This is a great topping for care package goodies as well as cookies and cakes at home. You have to try this! It’s easy and tasty and the possible uses are limitless! In a medium bowl whisk together the flour, baking soda, salt, pudding mix, and jello powder. Set aside. In the bowl of an electric mixer, cream shortening and sugars. Add eggs and vanilla. Beat until fluffy. Gradually add the flour mixture until blended. Stir in chopped freeze dried strawberries and chocolate chips. Using a two tablespoon scoop, place balls of dough (golf ball size) onto cookie sheet about 2” apart. Press down lightly on each ball to flatten slightly into a disc or puck shape. Cool on wire rack. When completely cool, decorate with flavored confectioners sugar or dip in melted chocolate. To make flavored confectioners sugar, place confectioner’s sugar and freeze dried strawberries in food processor and pulse until completely pulverized and mixed. Dust onto cookies with mesh strainer. To decorate with melted chocolate, melt chocolate chips in a small microwave safe bowl for 1 minute. Stir until completely melted. 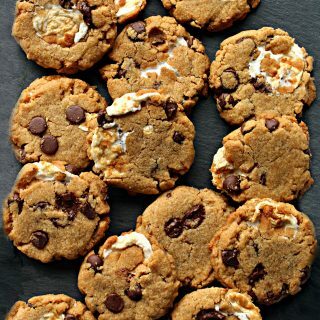 Dip half of cookie in melted chocolate and place on a wax paper lined baking pan. When all cookies have been dipped, refrigerate for about 10 minutes until chocolate is hardened. Then melt white chocolate in a microwave safe bowl for 1 minute. Stir until completely melted. Pour into a ziplock bag and seal. 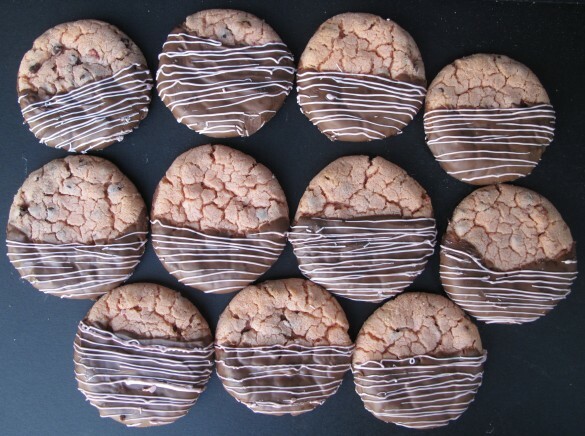 To make fine lines on top of darker chocolate, cut a tiny corner off the ziplock bag and pipe lines onto the cookies. Return the baking tray to the refrigerator for another 10 minutes to set the white chocolate. For longer storage, vacuum sealing or individually double plastic wrapping is recommended. Wrap pairs of cookies (with bottoms together) in plastic wrap, then place in airtight container or zip lock bag. Readers looking for strawberry treats loved these recipes too! Click on the photo for the recipe! Thanks, Jennifer! I am really excited about the flavored confectioner’s sugar too. 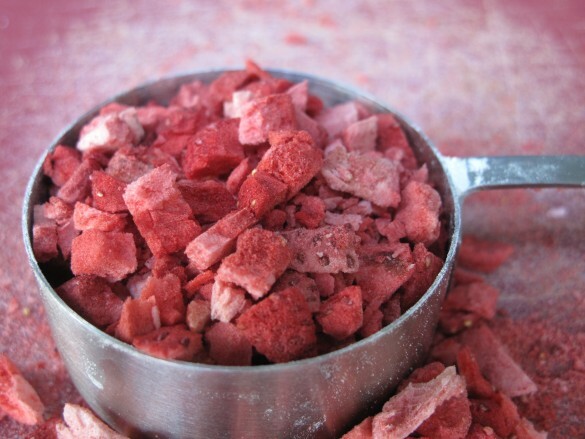 Basically, any freeze-dried fruit can be used. I found my strawberries at Target but have seen them at Trader Joe’s and my regular supermarket in the produce department. They also sell mango, pineapple, blueberry, and banana! I love reading your stories : ) I was a 5 pound preemie too. 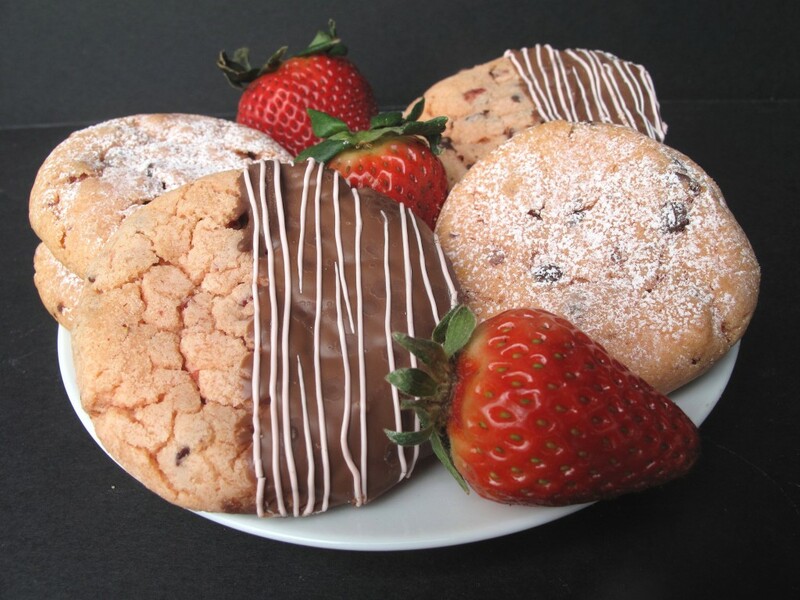 These cookies sound delicious – I love the strawberry and chocolate combination, but combined in a cookie? Even better! Wow, what a ridiculously amazing idea! These sound so phenomenal, definitely need to try them. Pinning and totally making soon. I’m a strawberry fanatic! Thanks, Rachel! Just a twist with the freeze-dried fruit to make it desert safe and it ended up with an extra strawberry flavor boost. If you take a study break and get to make these, please let me know what you think! Good luck on your finals! Loved the story about your kids cooking for you 🙂 These cookies sound divine! I don’t think I’ve ever made strawberry cookies. Sounds like I need to change that! What an interesting recipe. Such a good flavor combo! 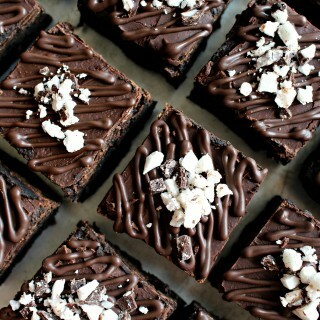 I totally want to make these…. Thanks, Amy! I was excited with how strawberry these cookies taste. Wow! Wendy, your kids are lovely! I admire that they cook for you! Maybe you know from my blog, I’m pregnant and expecting a son, due at the end of May. I’ve already started to dream about times we’re cooking with him together. Hope he likes being in the kitchen with me! And these strawbery cookies sound so intriguing to me! Never tried strawberry in cookies, must definitely try this. Also, thanks for the tip about flavored confectioners sugar! Congratulations Zerrin! You will be your son’s mom. He will love to be where ever you are! Both of my kids love to cook because we started doing it together when they were tiny even if it meant more flour and sprinkles in and on them, than in and on the cookies! 🙂 If you can get freeze-dried fruit in Turkey, I highly recommend trying it in baking and to make flavored confectioners sugar! This is such a sweet post! And these cookies look delicious. I know they are something my mom would love! I love how thick these cookies turned out! 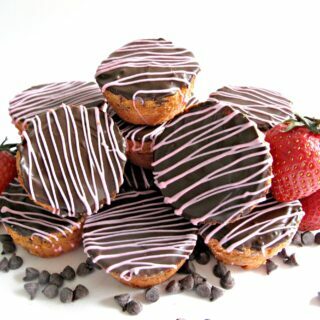 My Mom is a chocolate strawberry fiend and she would absolutely love these! Thanks for all your tips! 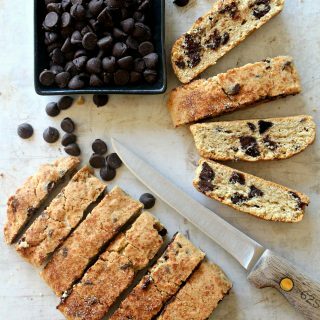 Freeze dried fruit to flavor confectionary sugar?! How cool is that! Do you have to let it sit in an air tight container or anything? Or do you just grind it up, mix it in and then sprinkle it on top? Great idea! What a sweet story about your kids making you dinner!!! And these cookies look killer!!! Yum!!! whoa: i never thought of flavoring powdered sugar with freeze dried fruit! so many things you could use that for; what a great idea. I like the idea of chocolate covered strawberries in cookie format; nice job! What a fantastic recipe! Gorgeous stories too… so sweet. 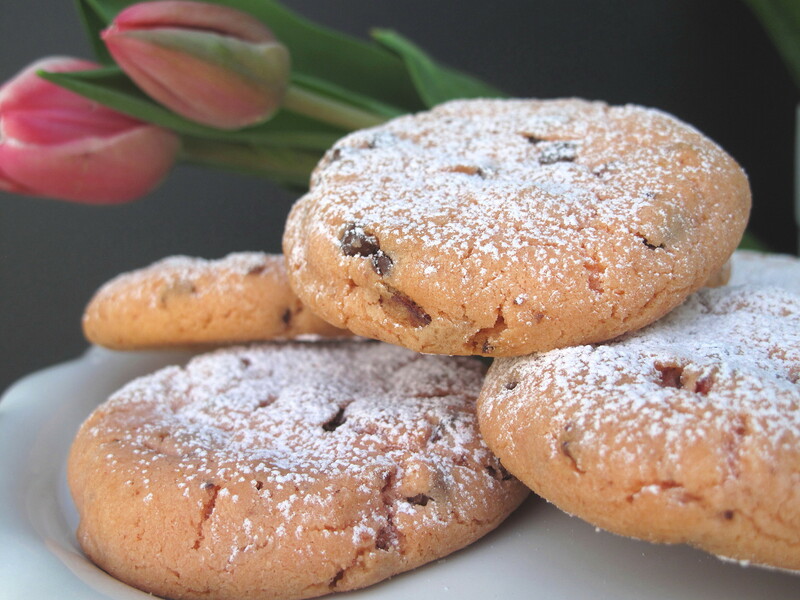 I love the idea of adding the jello powder to the cookie mix also… an easy, added flavour burst! 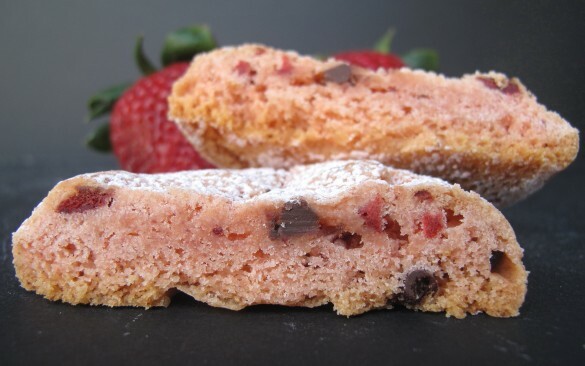 Genius idea to use freeze-dried strawberries, both in the cookie mix and for the confectioner’s sugar. 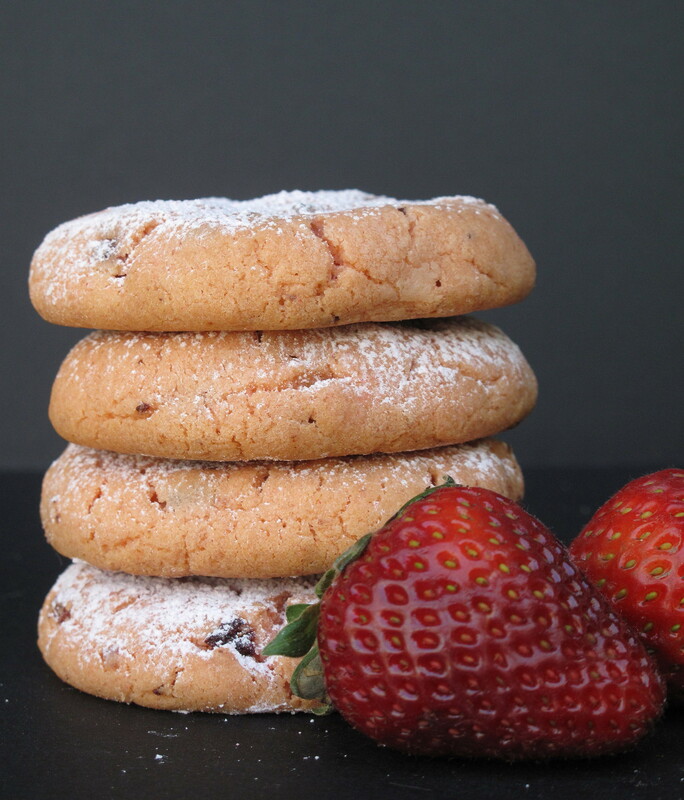 I’ve never added strawberries to cookies before, for fear of making them wet, so this allows a gorgeous fresh strawberry flavour (as opposed to using lollies or strawberry jam) with minimal added moisture. 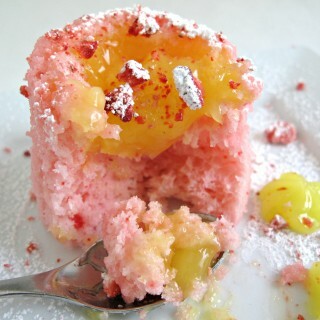 I will definitely be using the powdered fruit sugar idea. Thanks for sharing your tips!!! Thank you, Laura! I have been having fun playing with freeze dried fruit. 🙂 Not all of the experiments have been edible but these strawberry cookies and the banana cookies exceeded my hopes. 🙂 Moist can be ok in a cookie but too moist is especially bad for mailing cookies that might get moldy. Freeze dried fruit in the cookie or in the powdered sugar solves the problem. And you are so right about adding a fresh strawberry flavor! I love the hints on the butter and sugar! Looks delish and thanks for sharing on Throwback Thursday! Thanks, Mollie! Playing with flavored sugar was fun! Thanks for hosting! That is a lovely Mother’s Day tradition. It is hard when our kids move away! Glad you get a rain check though. It is thought-provoking thinking about the Moms in the military. It must be very hard to be away from your kids like that. 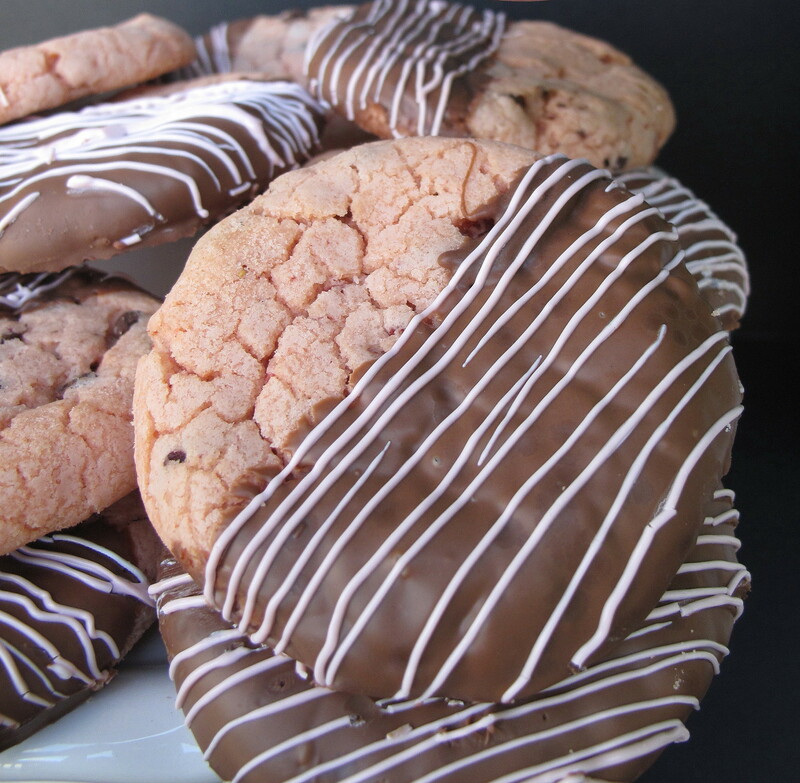 Your Chocolate Covered Strawberry Cookies look so delicious and so pretty too. Scheduled to pin later today. 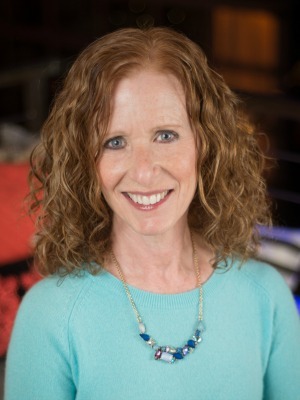 Thank you so much for being a part of Hearth and Soul, Wendy. Thanks, April! I am truly delighted that my son has always enjoyed cooking and isn’t at all intimidated to experiment in the kitchen. These days, I don’t get to taste his culinary projects, but he does send me texts and photos. 🙂 I can’t even imagine how hard it must be for moms and kids separated by military service. Thanks so much for pinning and for your hosting of the wonderful Hearth and Soul! Chocolate and Strawberries, a great combination! I really appreciate you sharing with us at Full Plate Thursday, hope you have a great day and hope to see you again soon! How precious are these cookies! Loved reading your stories! Thanks for sharing it here at FF! These look amazing! Featuring on Friday with our link party–Funtastic Friday! Thank you, Heidi, for featuring these Chocolate Covered Strawberry Cookies on Fantastic Friday!